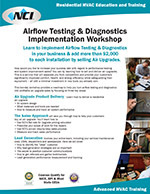 Learn to implement Airflow Testing & Diagnostics in your business & add more than $2,000 to each installation by selling Air Upgrades. How would you like to increase your success rate with regard to performance testing and system improvement sales? You can by learning how to sell and deliver air upgrades. This is a service that will separate you from competitors and provide your customers significantly improved comfort, health, and energy efficiency while safeguarding their equipment – all with a minimal investment in new tools you already own. Deliver high quality repair, maintenance and installation services, and produce professional reports and documentation using ComfortMaxx™ Air, to differentiate your company from your competition! Lower your labor rate. Air Upgrade renovations usually don't require your installers. Entry level renovators can keep your costs down. While there are no pre-requisites it's highly recommended that students attend NCI's Residential HVAC System Performance or NCI's one-day Airflow Testing & Diagnostics training beforehand. NCI Members Earn $30 NCI Bucks! Learning Excellence Program Subscribers Earn $89 NCI Bucks! 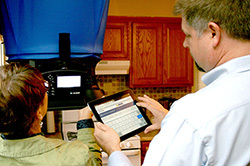 Register Online Today for Residential Airflow Testing & Diagnostics Implementation Workshop!